The MSIL Assembler Action allows you to automate running of the ilasm.exe .IL assembler. Type the pathnames of one or more .IL files to assemble (place each file on a new line.) Click the "Add file..." button to add a new source file. Optionally specify a .res file to include in the output file. Optionally specify the output file path. If no path is specified, ilasm will output <sourcename>.exe or <sourcename>.dll, depending on the target type. Specify whether to output an executable or a DLL file. 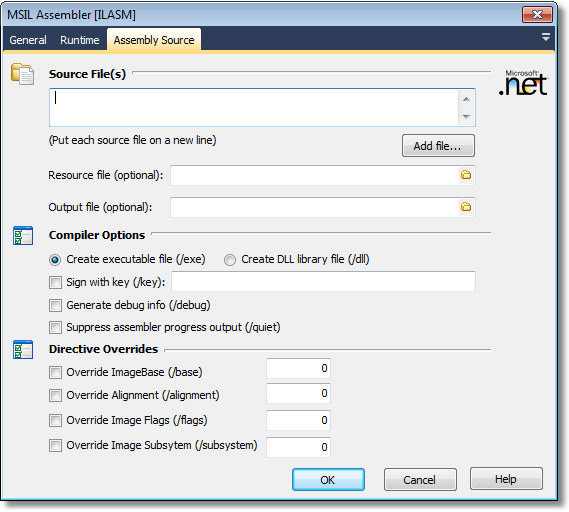 If this option is selected, a .pdb file will be generated allowing you to debug the built assembly. Suppresses the progress details which are normally output by the assembler. Each of these overrides corresponds to a directive which can be given in the .IL files. If an override value is specified here, it replaces the value(s) given in the source file(s).